We are looking forward to the 2014 Seneca Falls Dialogues “Ecofeminism: Cultivating Place and Identity.” The Dialogues will take place October 17-19 in Seneca Falls, and will feature Tanya Fields, BLK ProjeK Founder and Eco-Warrior as the Keynote Lecturer. 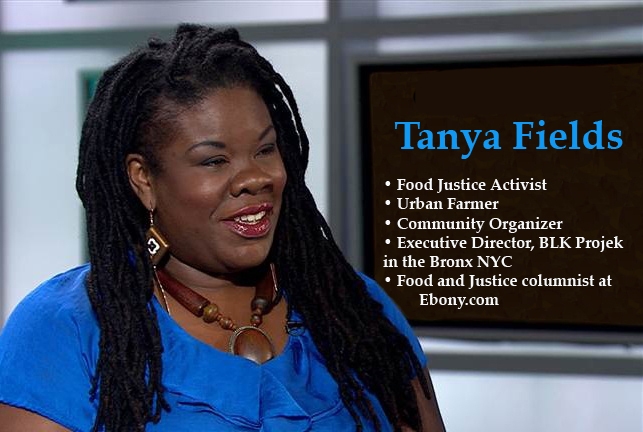 Tanya Fields is a leading food justice activist, educator, urban farmer, food blogger, and the founder and executive director of the BLK Projek. She is inspired by her experiences as a single working mother living in a marginalized community. Fields founded the BLK ProjeK in 2009 as a response to sexist institutional policies, structurally reinforced cycles of poverty, and harsh inequities in wealth and access to capital that result in far too many women being unable to rise out of poverty and sustain their families. The group was nominated for a 2011 Union Square Award and Tanya has the honor of being a Green for All Fellows, through which she connects with a national cohort of environmental justice change agents.This Bronx-based food justice and health organization serves underserved woman of color by creating women-led economic development opportunities and is committed to urban farming and the elimination of food deserts. Fields and her work are gradually revolutionizing low-income neighborhoods in one of the poorest congressional districts in the country. Fields’ passion for food and social justice, and her background in activism will certainly make for a speech not to be missed! We encourage students, activists, and teachers to submit proposals for this October’s Seneca Falls Dialogues. Join us and participate in a weekend of dialogue on the following themes: Gender and the Environment, Politics of Space, Activism, Food and Nourishment, Sustainability, and Identities and Bodies. You can find the official Call For Dialogues here. We hope you submit a proposal and attend the 2014 Dialogues! Nice to read this great article about the Tanya.. i am impressed to read about her and her achievements.. That’s really great information.. Thanks for sharing this information with us.